Time was of the essence with a solution required within a few months. Fortunately, Europa Technologies had an existing solution for precision risk assessment called Risk Insight. Risk Insight was already being used by other insurers to accurately score and visualise risk using perils datasets such the JBA Comprehensive Flood Map and the BGS GeoSure Insurance Product. Risk Insight’s flexible platform could be tailored to RSA’s specific requirements. This included utilising the AddressCloud service for fast and effective matching of addresses against AddressBase Premium. RSA was keen to share these benefits with its brokers. It was also important that brokers would have access to the same risk models as were used internally by RSA. Europa Technologies was able to quickly load these into the Risk Insight platform so that they were ready for use on day one. 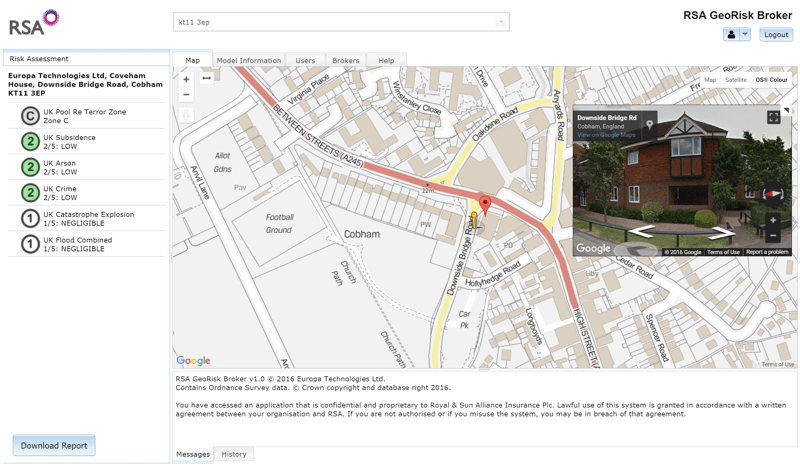 Additionally, Risk Insight utilised the viaEuropa hosted map service for the visualisation of Ordnance Survey base maps. viaEuropa was already widely used within RSA’s internal web and desktop applications to simplify the process of displaying high quality base maps. Using viaEuropa in this new application was the obvious choice. Importantly, this approach enabled RSA and Europa Technologies to meet all key requirements, including the challenging deadline. By building on an existing platform, RSA benefitted from savings in both development cost and time. RSA already had a strong working relationship with Europa Technologies, who provided Ordnance Survey data and a number of complementary hosted services. By implementing a solution based on Risk Insight, RSA felt confident that Europa Technologies would provide an innovative and agile solution on time. Additionally, RSA appreciated the customer centric approach of the Europa Technologies team, demonstrated through innovation and planning workshops to quickly determine the scope of the ‘minimum viable product’. This approach would enable RSA to provide brokers with the most important functionality first and deliver additional functionality in later phases. Risk Insight was adapted and rebranded to form the bespoke RSA GeoRisk Broker application. The implementation already supported services previously selected by RSA, including viaEuropa (hosted Ordnance Survey maps) and AddressCloud (a high performance, cloud-based, geocoder and search engine). The project was undertaken in phases and managed under formal project governance by RSA. After the release of an initial version, standard testing and deployment processes were followed before making the application live. GeoRisk Broker was rolled out to RSA’s brokers in stages, with a pilot group the first to receive access. The pilot provided important feedback not only on the functionality and usability of the application, but also on the user registration process. Initial feedback was used to simplify and streamline the process so that registered users were quickly up and running. The availability of user logs meant that the internal RSA project team could keep a close eye on levels of uptake. What were the results and benefits? GeoRisk Broker has provided a functional, cost effective tool for RSA’s broker-based business. Precision risk assessment offers significant benefits to RSA, their brokers and customers through better informed underwriting. The transition from spreadsheets distributed biannually, to a web-based service, provides significant benefits in terms of maintenance since risk models can be centrally upgraded as required. This eliminates the danger of a broker using out-of-date information and provides user access control and comprehensive activity monitoring. From the brokers’ point of view this project represents a massive step forward in terms of effective and accurate underwriting, and importantly is easy to use. 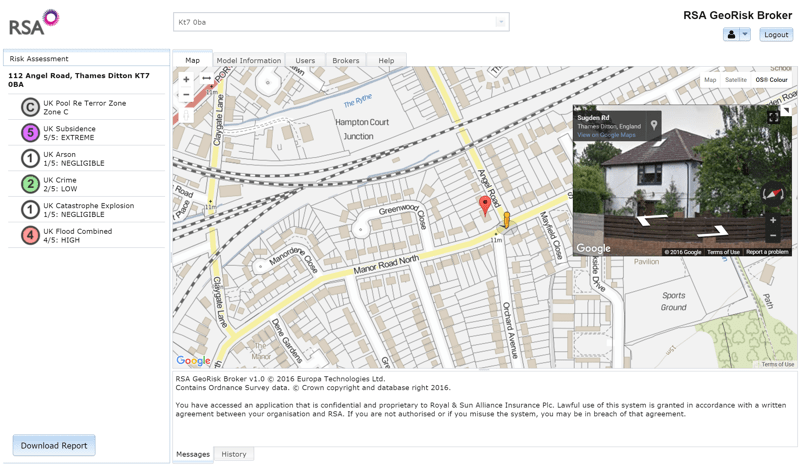 One of the first brokers to use GeoRisk Broker commented “By selecting the accurate address of the risk, it allows you to view Google Street View immediately, saving time checking the premises itself. The rating is given in more detail too which helps with understanding the risk better”. Above all, RSA will be able to measure the performance of its portfolio through future flood events. “We knew we had to improve our systems and do so quickly, so that our brokers could benefit from improved risk assessments, especially for flooding. GeoRisk Broker will ultimately help to improve the profitability of our business Europa Technologies has risen to the challenge and enabled us to meet it”. Europa Technologies is an award-winning specialist in digital maps and associated services for a wide variety of market sectors and applications. Our resources allow organisations with international interests to better understand their customers, assets and markets, in a geographic context, to gain a competitive or strategic advantage. Mapping products and services from Europa Technologies are used by many Fortune Global 500 companies, governments and missions of the United Nations. The company has global licence agreements with a number of leading Internet-based service providers including Google. Through deployment via Google Earth and Google Maps alone, our world data products have been seen by over one billion people, approximately 1 in 7 of the world’s entire population. For further information on our products and services for the Insurance sector, including a demonstration of the Risk Insight platform, please contact us today.